Chick Lit Central: Sarah Pekkanen is our first "third timer" and she has a book to give away! Sarah Pekkanen is our first "third timer" and she has a book to give away! Not only was Sarah Pekkanen the first author to share a review copy of her book with us, she was also our first (and only, so far) videotaped interview and now is the first author to appear at Chick Lit Central THREE times! We love having her here, not only because her books are amazing and insightful, but also because she is really nice both in person and online. It has been a pleasure to get to know her thus far, and we hope to continue to feature her and her books in the years ahead. For fun, check out her first interview from the summer of 2010, when Melissa A. got to chat with her in person. (They live near each other.) Then, take a look at her post about how and where she does her best writing. (And perhaps gets in a game of skee-ball on the side.) Now sit back and enjoy what she had to share with us today. 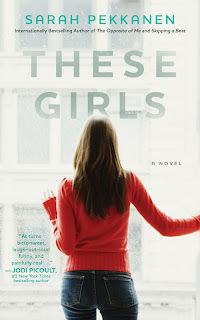 And while you're at it, enter to win a signed copy of her latest novel, "These Girls." (US/Canada residents only.) Amy and Melissa A. recently reviewed "These Girls," and agreed that it was fabulous, so don't miss out! If you haven't met Sarah Pekkanen yet (what are you waiting for?!? ), drop by her website and see when she'll be in a town near you. (She's staying close to home tonight.) You can also get to know her through Facebook and Twitter. Check out her trailer for "These Girls" and then call your BFF! I'm not sure if it's the most interesting, but the best comment was one I just got from a Library Journal reviewer, who said my books would be "strongly appreciated by fans of Emily Giffin and Jennifer Weiner." I love that comparison! I've learned that if my writing stalls, it's due to the fact that my subconscious is holding me back because something in an earlier section of the book isn't working. So I re-read the entire manuscript from the start and try to find out where I got off-track. I often cut or re-write scenes, and only then can I move ahead. I tend to not get writer's block otherwise, because as a former journalist, I learned to write under all conditions and still meet my deadlines - so I'm really lucky I had that early training. Did you learn anything from writing "These Girls?" If so, what did you learn? "These Girls" was the first book I wrote under deadline, and I was really nervous about finishing it in time, so I plotted the entire book very carefully. But I learned that I enjoy being surprised by the direction my books take and I like to have room for spontaneity, and so after finishing "These Girls," I changed my writing process and went from all-out plotting to creating a general outline. I may go back to plotting again in the future; I want to be open to different methods and the chance to experiment until I find out what works best for each novel I write. In one sentence, please share some advice for future writers. Treat writing like exercise - do it almost every day to get results! A book with humor and heart. It seems like all the women I know are navigating the same issues - love and work and relationships - and good chicklit books tap into those themes and entertain us as well as connect us to one another. Which of your books would you want to see as a movie and who would you cast in the lead roles? I just signed with a film agent, and he's going to start shopping around "These Girls," so I hope this might actually come true someday! I'd love to see Emma Stone and Emma Roberts in two of the lead roles. The third actress wouldn't necessarily have to be named Emma, though - how about Jennifer Lawrence? Wow, these questions are really on target because I just completed my fourth book and turned in my manuscript to my editor. And one of my main characters is named Savannah! Favorite ride at an amusement park or carnival? The ice-cream booth. Oh, wait, you said ride? I love those swings that go high into the air and spin around and around while you look up into the sky. What is the last restaurant you ate at? Would you recommend it? I had the best dinner just last night at The Daily Dish, a terrific little place in Silver Spring, Maryland. I went with a group of authors including Eleanor Brown ("The Weird Sisters") and Siobhan Fallen ("You Know When The Men Are Gone") and we all talked shop and laughed and traded stories about our lives. I had the veggie plate, which was good, but regretted not ordering the mac and cheese after Eleanor reported that it was the best she had ever eaten! For dessert, I had lavender creme brulee which was insanely good. I'd highly recommend it! Other than my wedding reception, I'd have to say the launch party for my first novel, "The Opposite of Me." It was thrown by a local magazine and so many of my friends and family attended, as did two of my elementary school teachers. I remember standing up to give a little speech, and taking a moment to look into the crowd and see the faces of so many people I love, all sharing the culmination of the dream I'd had ever since I was a little girl - to become an author. It was a magical night. Special thanks to Sarah for making her third time here as charming as her first two times and for sharing another amazing novel with our readers! 1. Please tell us: What do you think the key is to a successful chick lit novel? US/Canada only. Giveaway ends April 15th at midnight EST. I feel a successful Chick Lit novel must have interesting plot, characters and story. I think a successful Chick Lit novel should have believable and interesting characters. Recently I've picked up far too many novels where the heroine is rich, brilliant, gorgeous, fit, witty, and the desire of all the gentlemen. Come on! Yay for a third-timer! haha :o) These Girls sounds so good, and what a fun interview too! The most important aspect of any novel is the voice of the main character. It must be interesting, someone you want to talk to. You don't have to agree with everything the person says but you must be engaged with him or her on a personal level. That's my four entries, Thanks! I loved Sarah's first 2 books! I can't wait to read this one. In a chicklit book, I love a strong heroine who is somewhat flawed, makes her more relatable. Humor is good too:)! I follow this blog, tweeted the post & follow you on FB. 1) I think what makes a good chick lit novel is relatable characters. Characters the reader can personally identify with or knows someone just like the characters. I feel a successful chick lit novel must have a lead heroine that we root for. I've read many where I didn't like the lead at all so I didn't care enough about what I was reading. And I want a happy ending! thanks for the chance to read sarah's latest masterpiece. I just want a story that is believable. I don't like to read something too bizarre. This author sounds like one I'd enjoy. I'm glad I'm following Chick Lit Central's Blog. O2. I think believable characters is the most important thing in a chick lit book. If I cannot believe the characters, I can't get into the story. I think the key is realism. People need to realize that chick lit isn't fluffy girl-meets-boy writing. I think the key to a successful chick lit novel is a strong main female character that is relatable. I follow the blog on Twitter (@greenurlifenow) and will post this contest on Facebook. Am a member of CLC on FB. I love Sarah Pekkanen! Her books are fabulous! 1) The key would be characters that are lovable and ones that you can relate to. 3) I'm a FB member of your group! I think the key is a character or characters that are real enough that as a reader you can identify with. I think a successful CL novel is one that reaches out to many people, a current or past relatable subject/topic, inspiring characters of hope, strength, support and perserverance. I'm definitely a happy follower! Great interview! I love insight into writers' live and processes. I've read very positive views of These Girls and would love to win a copy. I read Sarah's first two titles as ebooks and would love a hard copy of her work to grace my shelves! I think a great chick lit book has to have real, well-developed characters and dialogue that feels genuine. When a character is just a collection of stereotypes with a cool name, I'm not drawn in. When dialogue is stilted, I can't stick with a book. I love Sarah Pekkanen's novels and her hilarious fb upfdates, so it won;t come as a surprise that a successful Chick Lit novel should have humor as a key ingredient. I follow Sarah and CLC on fb and blog. Thanks for the chance to win! Good characters who are smart and funny. Strong characters who blend well together. I want to see them interact and the chemistry between them. I think the key is humor and great characters! I love Sarah's work! Chick Lit must have a heroine with heart and a little humor! Having a realistic character - usually one that has faults we can identify with! Almost missed this giveaway - FB turned off my notifications for your page! BOO! I think the key to a successful chick lit book is to have interesting, likeable, and realistic characters. I think it's based on good characters and plot.